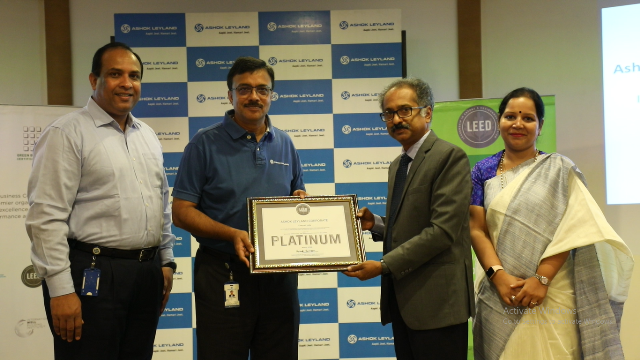 Ashok Leyland’s corporate office in Chennai has been awarded LEED v4.1 Buildings Operations & Maintenance certification at the Platinum level today. LEED v4.1 is the newest version of the LEED (or Leadership in Energy and Environmental Design) rating system, developed by the US Green Building Council (USGBC). With this honour, Ashok Leyland becomes the first office in India and fourth in the world to receive LEED v4.1 Platinum certification. The Ashok Leyland’s office is located in the heart of the city, with easy access to bus, metro and rail networks. The ease of access created due to the location of the Chennai office leads to a high share of public transport usage. The project achieved 91 points, and continues to monitor, analyze and optimize their performance by using the Arc platform. Sustainability features at the project include a rainwater collection tank that captures 100% of rainwater runoff and low flow water fixtures to reduce water consumption. 100% of the waste generated at the building is segregated on-site, pre-processed and recycled or diverted from landfills. To ensure occupants health and well-being, the site has enough outdoor air intake as per ASHRAE standards, ensuring low CO2 and TVOC levels.